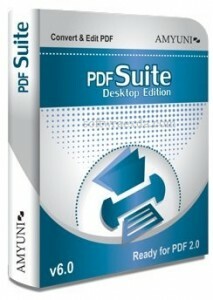 Amyuni PDF Converter PDF Suite Desktop is comprised of the Amyuni PDF Converter and PDF Creator. The Amyuni PDF Converter is a virtual printer driver that quickly converts documents from any Windows® application to PDF. The PDF Creator is a PDF editor that enables you to modify, annotate, merge, and print PDF documents. The Amyuni PDF Converter is a virtual printer driver that quickly converts documents from any Windows® application to PDF.